Expand the possibilities of your amp with this tour-grade, do-all box. Bringing together a diverse range of professional tone tools for the very first time, the Waza Tube Amp Expander elevates the tube amp experience to a new level of versatility for stage performing and studio recording. 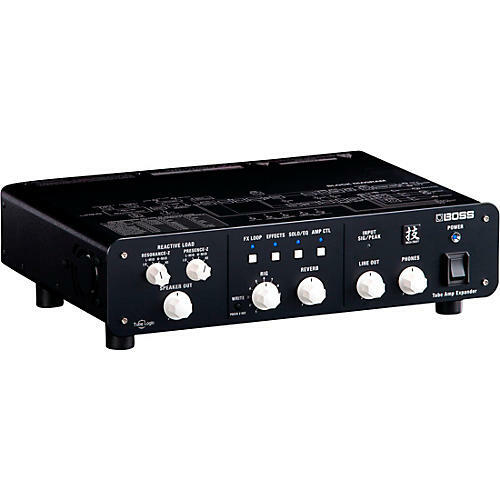 This amazing device does it all—it’s a variable reactive load box, active analog power stage, mic’d cab emulator, IR loader and recording interface, all in one integrated unit that’s road-ready and easy to use. Backed by BOSS's advanced Tube Logic approach, you’re able to crank your amp to its sweet spot and play at any volume while faithfully retaining the core tone and feel you love. And with extensive connectivity, built-in BOSS effects, 10 fully customizable rig setups, and deep real-time control, you have unparalleled creative command for any scenario. Packed to the max with breakthrough BOSS innovations, the Waza Tube Amp Expander is an essential companion for every tube amp player. The Waza Tube Amp Expander’s advanced reactive load section completely eliminates these artifacts, allowing you to experience your amp’s true cranked-up sound and interactive feel while controlling the volume to suit any situation. A key feature is the Resonance-Z and Presence-Z panel controls, which optimize the all-important impedance interaction with your amp’s output transformer. Selecting from 16 different settings, you can make your amp behave and respond exactly as if it were connected to your favorite speaker cab. Any tube guitar amp up to 150 watts is supported, from vintage combos to modern high-gain heads. Once you’ve dialed in your amp to the sweet spot, the Waza Tube Amp Expander lets you deliver that glorious sound to multiple destinations at once. With parallel speaker outputs, you can drive up to two stage cabs from the integrated 100-watt Class AB analog power stage. Along with providing smooth, non-stepped level control for any connected amp, this robust power stage also opens up the ability to boost a favorite low-wattage amp to stage-ready volumes. Balanced mono and stereo line outputs include tone shaping from onboard mic’d cab emulation or user IRs, providing ready-to-mix direct signals for the main PA mixer, stage monitors, and recording devices. There’s a USB output as well, offering another direct feed for tracking with your preferred music production software. And with the dedicated phones output, you can practice with rich tube tone without disturbing others nearby.